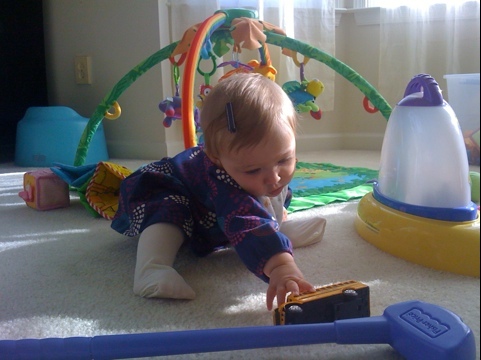 Crawling is an exciting milestone and Thing 4 is getting close. These pictures show how close. But these pictures also hint at trouble on the way. 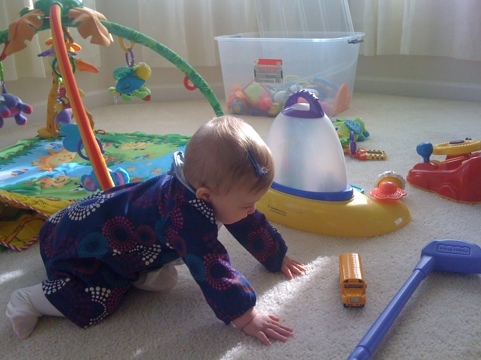 Sure, crawling means she will start getting into stuff around the house so we need to watch her at all times. But the trouble that’s coming isn’t for me. We’ve got the baby proofing pretty well down by now. No, the trouble that is coming is for Thing 3. His world is about to get turned upside down. Until now, he has been the one getting into his brothers’ stuff. And as the youngest he generally gets his way.? That’s about to change. Do you see in the pictures what is motivating Thing 4 to crawl?? She is trying to get one of Thing 3’s toys.? Until now he didn’t care much what she was doing. ? But as soon as she takes one of his toys he will NOT be happy. And that will be Trouble with a capital T.? Thing 4 is going to be one tough little girl. Good stuff.. It reminded me of when my son was taking his first steps.. His older sister didn’t want him to have the spot light so she pushed him down for the first time a few seconds later..